If you were blown away by the Galaxy S5, but just can’t bring yourself to fill the bank account of Samsung, then fear not, as Goophone has you covered with their imaginatively named S5. Samsung’s unveiling of its next flagship device has undoubtedly peaked the interest of the smartphone using community, and based on a quick glance and browse of the device’s specs, you would be forgiven for thinking that the Goophone S5 is the same device. However, it’s not. It’s a very convincing copy that’s taken less than two days to get out into the real world. An initial glance of the two devices side-by-side makes them look pretty much identical. The knockoff S5 obviously contains the "Goophone" branding on the rear shell, but that appears to be the only design element that differentiates the two pieces of kit. After looking over the technical specifications of the device, it appears that aesthetics aren’t the only area that have been inspired by the Galaxy S5. Consumers looking to try and replicate the Samsung experience for a fraction of the cost will receive a 5-inch device with a 1080p, 1920 x 1080 display. The Goophone S5 ships with a 2GHz MTK MT6592 octa-core processor with 2GB RAM on-board. There’s been a debate recently over whether or not Samsung should have offered the 32GB Galaxy S5 as the minimum option due to the amount of storage space that is actually available to the user. The Goophone S5 is only available as a 32GB variant, but does also offer the ability to expand that capacity through the use of a microSD card. The technical specifications of the hardware is finished off with a rear facing 13-megapixel camera and a front facing 5-megapixel offering. The replica S5 will ship with Android 4.2, and not Android 4.4.2 which the real Galaxy S5 will ship with. 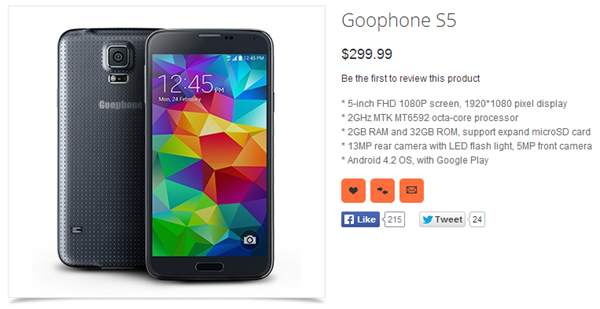 Goophone clearly isn’t ashamed of hitting the market with products that have been copied from larger manufacturers. Historical Goophone products include the i5C and the i5S, both featuring heavy design inspiration from Apple’s latest smartphone offerings. The official site for the product is currently showing as "out of stock", and although we would never part with our cash to get our hands on such a blatant rip-off, we would be very interested in seeing how the hardware performs when compared against the official Samsung device.